The Creative Woman was a quarterly feminist journal produced at Governors State University from 1977-1992. The content featured the work of GSU faculty, staff, and others on a wide variety of topics of interest to women. Issues were comprised of articles, poetry, verse, biographical sketches, essays, non-fiction, fiction, book reviews, photography, and original graphics. Issue themes included women&apos;s involvement in science, religion, business, energy, law, politics, and psychology; and the lives of Russian women, Chinese women, American Indian women, lesbians, and women coping with disabilities. The Creative Woman was a unique Illinois contribution to herstory and the feminist movement in America and abroad. The intent of the journal&apos;s creators can be summarized in this quote from the first issue: "We are creative individuals and that creativity has been ignored. With this thought in mind, we decided to create a vehicle for women everywhere to express their own forms of creativity." The publication was a success, transforming over fifteen years from an initial typewritten newsletter of ten pages to a professionally printed journal of fifty-six pages. More information about the journal and editor Helen Hughes can be found at this online guide to The Creative Woman. 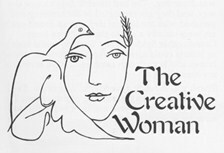 The Creative Woman was digitized with permission of the Governors State University Library by the Internet Archive in 2012 with funding from CARLI: Consortium of Academic and Research Libraries in Illinois. To view all the journal issues in chronological order, click on the Browse collection link at top left. Most, but not all, issues of The Creative Woman had themes. To read one of these themed issues, choose from the selections below.